Here's another holiday card I made, this time using the Poster Tidings stamp set. To make my card, I stamped the image onto White Daisy cardstock using Versamark ink, then sprinkled Clear Detail embossing powder over top and heat set it. Then I used 3x3 sticky notes to mask off the sections and applied Ruby and Juniper inks with my sponge daubers to add the colour. Then I just trimmed it out, leaving a little border showing. 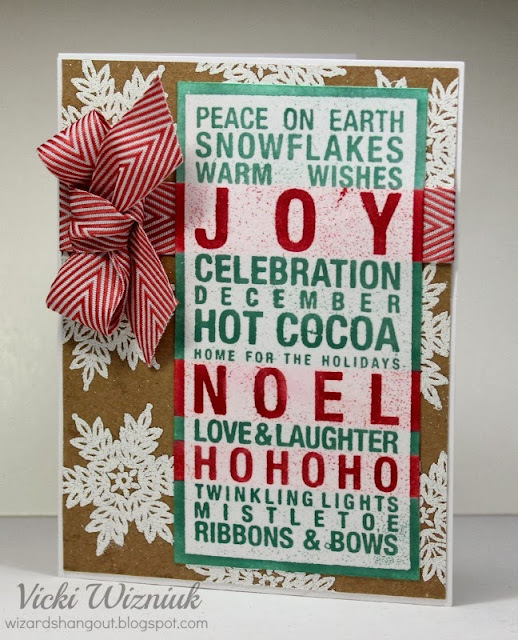 For the background piece, I randomly stamped the snowflakes from the Snowflakes stamp set and Versamark ink onto Kraft cardstock, sprinkled them with White embossing powder and heat set them. Added a Cranberry Chevron ribbon and bow, and that was it. This is really gorgeous, Vicki! I confess, I've barely used my Sept SOTM and the one I embossed and inked got thrown out, it was so terrible. So I'm going to try your version - I love the stripes! What a great technique!! I'll be "borrowing" this for sure! !